We went back in time and around the world! 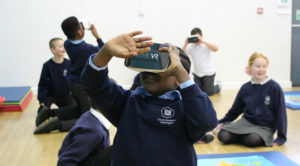 This week Years 3, 4 and 5 took a trip back in time and around the world with VR headsets. Year 3 got to visit a rainforest on the other side of the world, looking at all the plants and animals there. 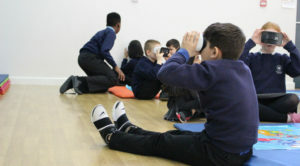 Year 4 travelled back to Ancient Greece, and saw what life was like back then. It was a great way to try and understand what it was like all those years ago, and helped them with the class learning on the topic. Year 5 also took a trip back in time to the Stone Age, which they have been learning about in class. They got to see some of the theories of how Stonehenge was built. This included using logs, pushing the stones and relying on giants! 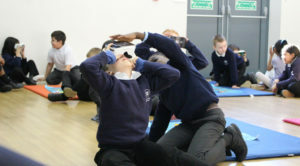 Year 5 liked that idea the best. 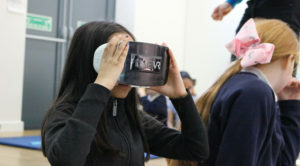 All the pupils had a lot of fun learning about their topics in a totally new way. Home > Stories > We went back in time and around the world!